This brightly coloured board book is specially designed to appeal to babies - with simple, high-contrast illustrations, touchy-feely tactile areas, fingertrails to trace, flaps to lift and music to play. Each page has a different festive scene to explore, including a slippery, sparkly ice rink, a beautiful Christmas tree and baby animals in their beds waiting for Santa Claus. Children can listen to a different Christmas tune on each page by pressing the chunky buttons on the sound panel. The perfect Christmas book, designed to appeal to babies with simple, high-contrast illustrations, touchy-feely tactile areas, finger trails to trace, flaps to lift and music to play. 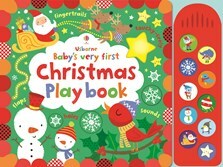 Full to the brim with seasonal features for the youngest readers, this playbook explores Christmas scenes embellished with a stimulating and engaging variety of interactive elements. Always a smile when he looks at this (10 months), loves to turn the pages and feel the different textures. Fantastic, want the animal one next. My daughter (9mo) loves this book. After we made the animal noises for her, she would point at each animal and squeal in imitation! It is a very eye-catching and attractive book for babies.